Toy Story Midway Mania continues to be one of the most popular attractions in all of Walt Disney World. There are routinely waits of 90 minutes to 2 hours. 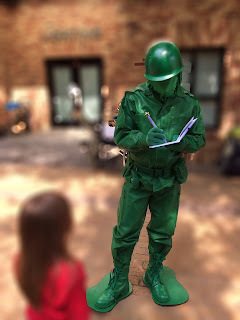 While walking through this crowded section of Hollywood Studios, guests may encounter one of the green army men patrolling the area. This one stopped to sign an autograph for my young tour guest last week. 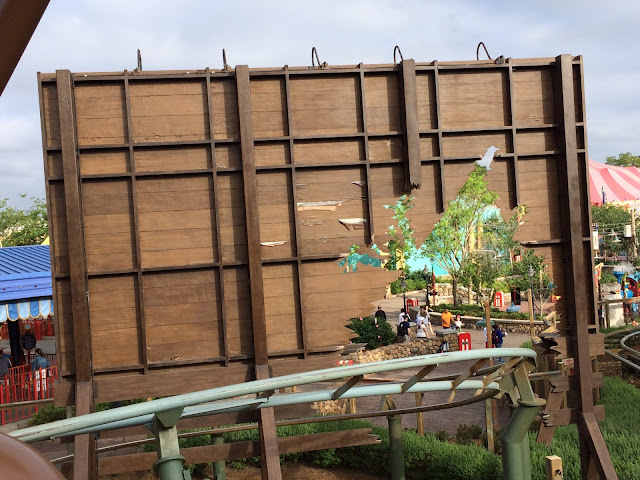 When you approach the Barnstormer roller coaster in the Magic Kingdom, you see this giant billboard that The Great Goofini crashed through. As always, I look for interesting perspectives of common Disney World sights. Last week I took this shot of the billboard from the backside. This view can only be seen while actually riding the coaster. I recommend holding on tight to your camera (or phone) when attempting this shot! Today, while riding Peter Pan's Flight, my pirate ship briefly stopped right in front of Wendy walking the plank. This is a shot I've been trying to get for years, but it is slightly too dark to get a good quality photo while "flying" by. Today, I was lucky enough to be sitting still when I snapped this picture. 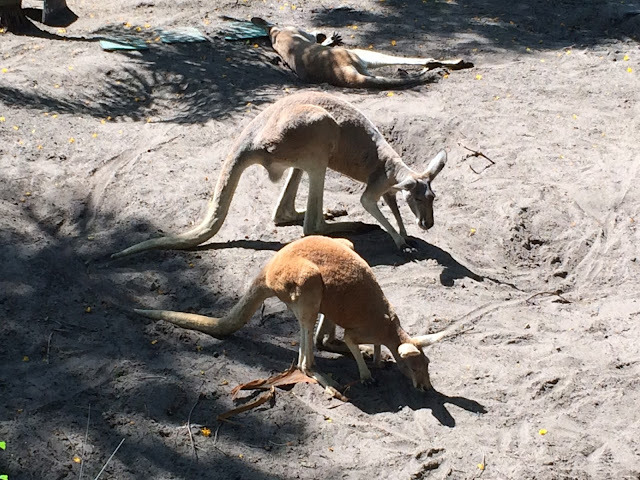 There is a great Kangaroo habitat at Animal Kingdom. It is a favorite spot of mine, because so few people even know it exists. 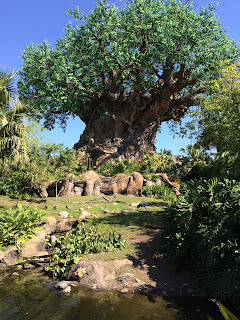 The best viewing "path" is accessed through a newly created FastPass service area to the left of the Tree of Life. I spent a good amount of time watching this group of playful kangaroos on Earth Day, which was last Tuesday. I took this panorama from the entrance to the Magic Kingdom earlier this week. Disney built the Grand Floridian on the Seven Seas Lagoon in a location that is easily seen by guests who are entering or exiting the Magic Kingdom. I enjoy taking early morning shots like this, while the vacation kingdom of the world is still quiet and calm. 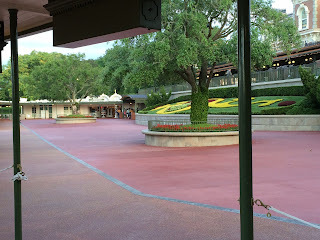 This area just inside the gates to the Magic Kingdom is usually packed with people. However, I was there very early on Wednesday before the park opened. It is rare to get this shot with absolutely nobody in the picture. The irony is that the Mickey "floral" in the right side of the photo is the most photographed spot in the entire world. Much like Haunted Mansion and Pirates of the Caribbean, Rock 'n' Roller Coaster is an attraction where guests can't see the main "show" building from the entrance. However, while walking up Sunset Boulevard, you can see this gigantic structure in the distance. I took this shot today from the right side of the street, while walking toward the Beauty and the Beast show. 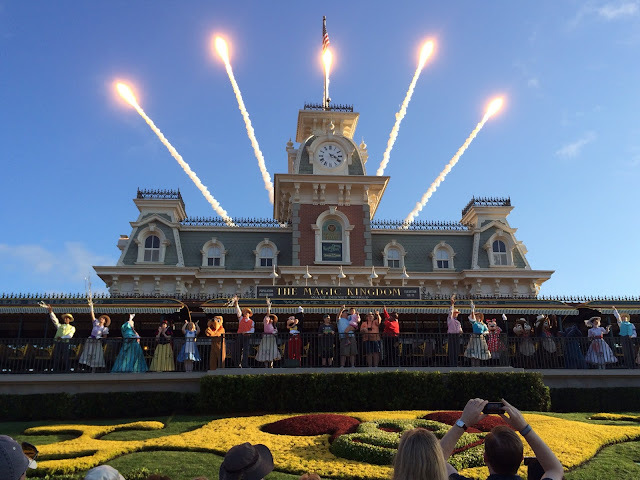 Each morning there is a "welcome show" at the Magic Kingdom. Mickey and his friends come out on the Walt Disney World steam train to officially open the park. 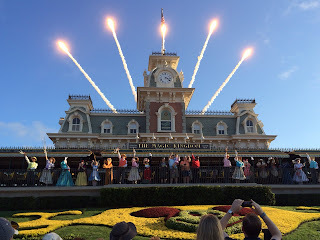 They do a countdown backwards from ten, and when they hit zero, there are fireworks and streamers that signify that the Magic Kingdom is open. I was able to time the fireworks pretty well this morning when I took this shot. Today we say happy 16th birthday to Animal Kingdom. This amazing park opened on April 22nd, 1998. It is not a coincidence that Disney decided to open on Earth Day, as Animal Kingdom is themed entirely around animal conservation. 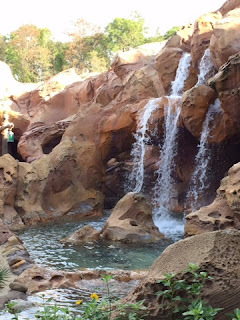 It is the newest park at Walt Disney World and by far the largest. I took this picture today while enjoying some time walking around the Discovery Island trails. This morning, I made a quick stop at the Grand Floridian on my way to the Magic Kingdom. I wanted to get a picture of the annual giant Easter egg display before it is removed. Each of these edible chocolate creations weighs 9 to 12 pounds and stands 16 to 20 inches tall. 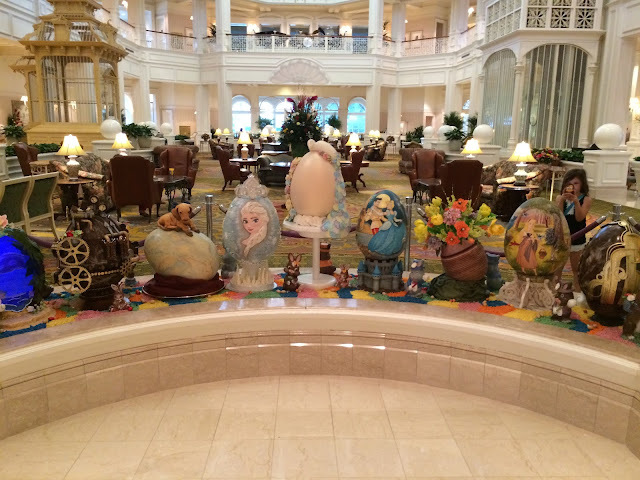 This year, they have added a "Frozen" egg, which is certainly not surprising. 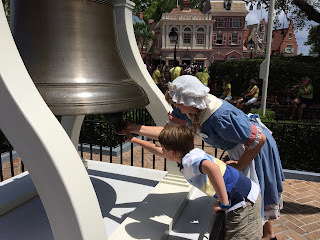 The Liberty Bell in the Magic Kingdom is an exact replica of the actual one in Philadelphia. In fact, it was cast from the same mold. I took this shot in Liberty Square while giving a tour about a week ago. You can see one of my young tour guests ringing the bell with the help of a Liberty Tree Tavern cast member. 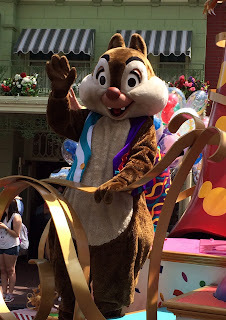 Although Mickey is the "big cheese," Chip and Dale are also popular characters in the Disney parks. They can be found in several meet-and-greet locations, and guests sometimes wait in long lines for pictures and an autographs with this duo. I took this shot of Dale on Main Street at the Magic Kingdom, as he rode by in the Move It, Shake It, Celebrate It street party. This photo is from the finale of the Indiana Jones Epic Stunt Spectacular at Hollywood Studios. I've posted pictures from the show in the past, but I took this recent shot last week. Indiana Jones has been a fixture in this park, and has changed very little since it's opening in 1989. It will turn 25 in August of this year. 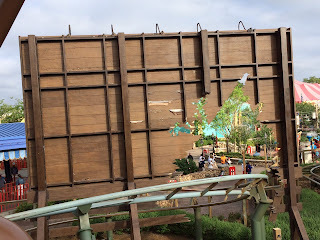 They are doing some extensive construction in the "hub" area of the Magic Kingdom. 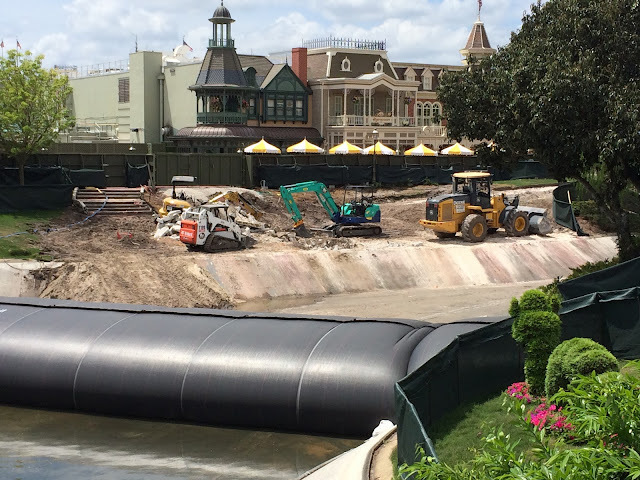 Because of the crowd congestion during the parades and fireworks, they are filling in the moat in the area near Main Street to create more walking paths. 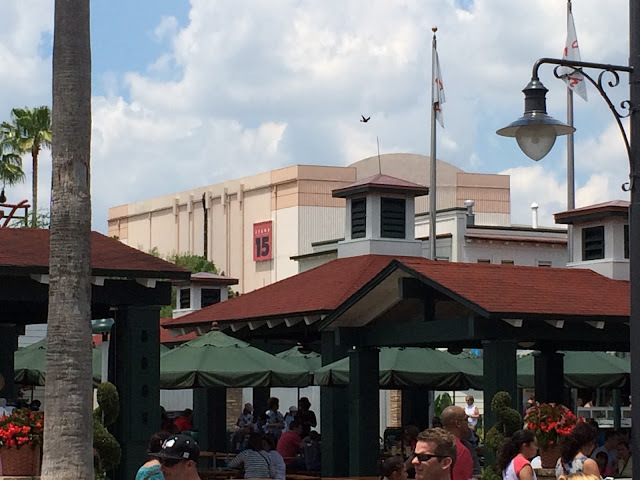 The area in this shot includes the now demolished "smoking patio," as well as the Plaza restaurant in the background. Today, my wife and I had a chance to try the Big River Grille & Brewing Works for the first time. It is located at the Boardwalk Resort and it serves lunch and dinner. They also brew their own beer at this spot. We sat outside, and there was a nice view of Crescent Lake. The food was very good and we look forward to returning in the future. 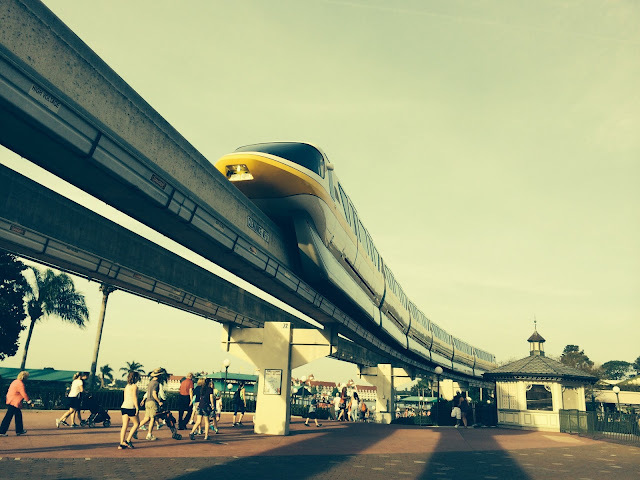 Today we say happy 43rd anniversary to the Walt Disney World monorail system. On April 15th, 1971, the last of 337 concrete beams was lowered into place, completing the "Magic Kingdom Loop." Also, the first monorail was lowered onto the beam. I took this current picture of the monorail last week, but gave it a retro filter to make it resemble a photo from the early 70s. 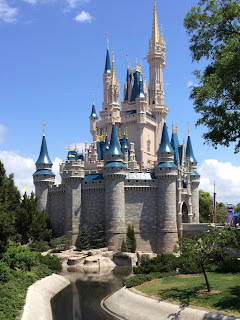 I haven't posted a photo of Cinderella Castle in a while. There had been a crane (or two) near it for several months. They had been doing some painting and maintenance and the crane certainly took away from the "fantasy" of the castle. Also, the moat surrounding the hub of the park had been dry for a while and was just refilled last week. With Cinderella Castle back to its normal majestic look, I decided to take this shot from the Liberty Square bridge. 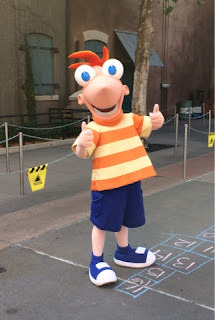 I was waiting for my tour guests at MuppetVision 3D today and noticed Phineas and Ferb with nobody in line. So, I walked over and got a quick picture with the famous Disney Channel duo. This is typically a popular meet and greet at Hollywood Studios, and the line gets long right after the Muppets crowd lets out. Shortly after posing with me, Phineas came out to play hopscotch and I snapped this shot. 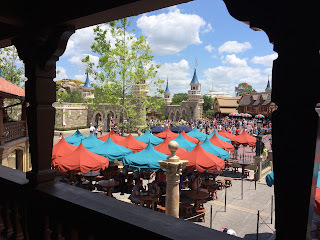 Today, I had lunch upstairs at Pinocchio Viilage Haus. This restaurant had been under refurbishment for a while, and this was my first visit in quite some time. I enjoy he view from the balcony and decided to take a few pictures. You can see the top of the nearly completed Seven Dwarfs Mine Train attraction in the distance. 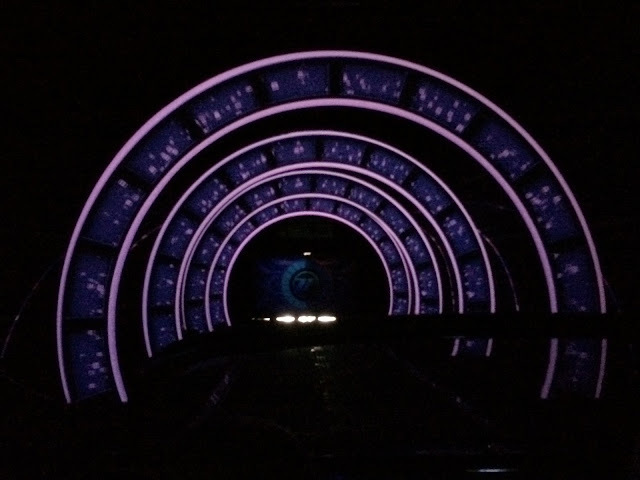 While riding Test Track yesterday, our car temporarily stopped at an interesting part of the attraction. We were sitting in the spot just before the high speed portion. It was only for about two minutes, but it seemed longer as we anticipated the quick acceleration to begin at any moment. It had a similar feel to sitting on Rock n' Roller Coaster just prior to the launch. While waiting for my tour guests to finish lunch at the Coral Reef today, I noticed several monorails pass by overhead. 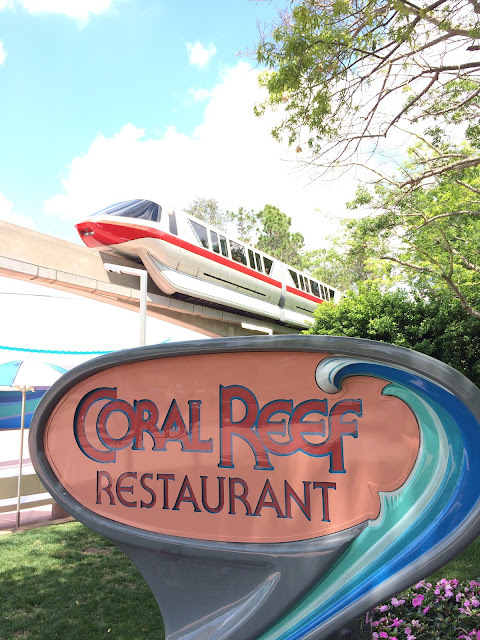 I thought this looked like a good angle to get the restaurant sign and the monorail in the same shot. Many of my guests enjoy eating at this spot in Epcot, as it has good food and great views of the aquarium. This is an example of an area that is rarely seen by guests. A few weeks ago, I had a tour group with a little boy who was sensitive to noise who was about to get on Star Tours. They had already entered the queue when I remembered that I had ear plugs in my bag. So, I caught up to these guests to deliver the ear plugs. 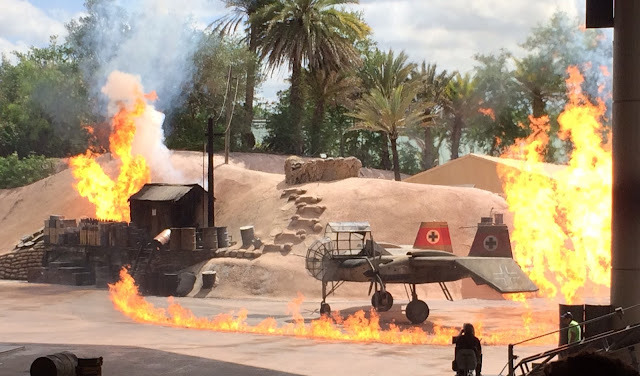 I then asked a cast member if their was an easy way out without getting on the ride or backtracking. He guided me to this corridor that allows guests to go directly to the exit and into the gift shop. It is basically a cut-through between gates C and D.
With the 50th anniversary of "it's a small world" only a few days away, it was time for another picture from that attraction. This sign is hanging right near the wheel chair entrance. I took this shot today while waiting for my tour guests to finish their "cruise." On busy days, one of the the exits from the Frontierland railroad station takes guests through a "tunnel like" path through the rock work of Splash Mountain. Today, I was walking on that path when I noticed this unique view of a log carrying guests up the first lift hill. 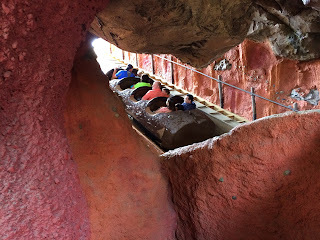 It is fun to find a new perspective of an attraction that I've been riding for more than twenty years. As you walk into the Magic Kingdom and under the train station, the "coming attractions" can be seen on the walls. 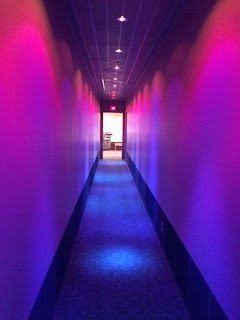 It is meant to be like a movie theater, and as you walk into this park you are transported into a show. 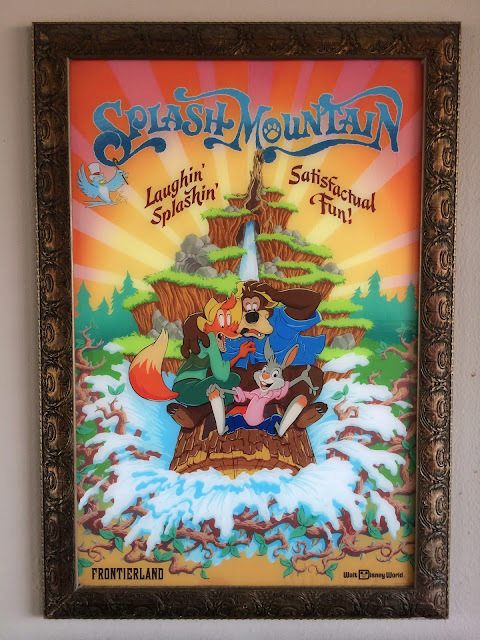 I took this shot today as it foreshadowed my family's ride on Splash Mountain. It was our first trip on Splash since the major refurbishment was done over the winter. 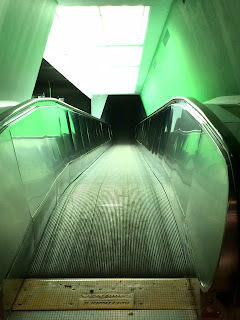 This is a view of the exit ramp of Space Mountain. 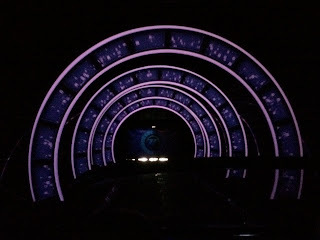 I snapped this shot last week while waiting for my guests to come off the attraction. In the old days, I'd actually be standing outdoors in this position. However, Space Mountain now exits into a giant gift shop and arcade. We spent a little time over at the Kidani Village pool this afternoon, and I came across this gem. This is the rock work on the outside of the water slide. Inscribed in the rock is "It's a small, small world" - Walt Disney. 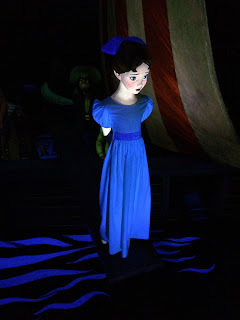 I came across this at an appropriate time, as we are coming up on the 50th anniversary of the small world attraction. There are many interesting weathervanes around Walt Disney World. 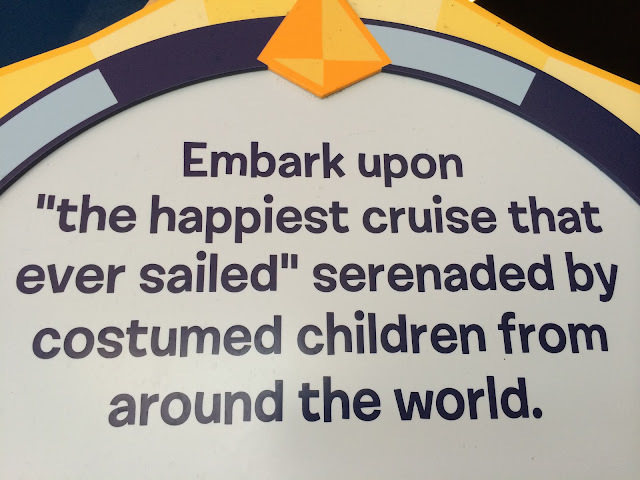 This one caught my eye while I was giving a Magic Kingdom tour last week. It is Tick-Tock the Crocodile from the movie Peter Pan. 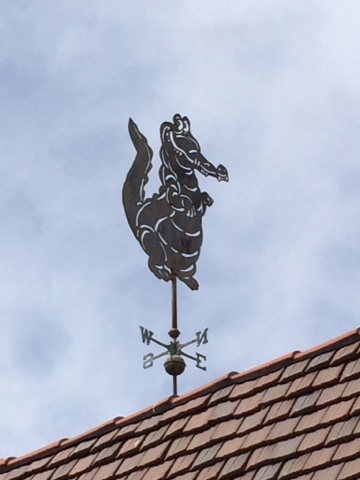 It is located atop the building that houses Mickey's Philharmagic and of course, Peter Pan's Flight. Continuing with yesterday's water theme, today's shot is from Under the Sea - Journey of the Little Mermaid. I took this photo of the waterfall from the FastPass queue. 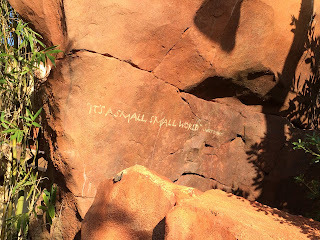 The level of detail to be found in the rock work is quite amazing, and Prince Eric's castle can really be considered an attraction unto itself. 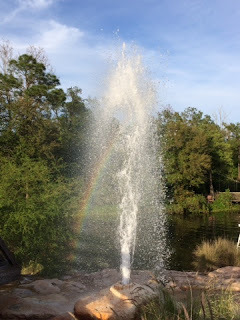 As I was waiting for my tour guests near the exit of Big Thunder Mountain yesterday, this geyser caught my eye. It was late in the day and the sun was hitting it just right to create this rainbow effect in the water. Most of the time I am standing here in the morning, but the late afternoon sun makes for some great photo opportunities in this area of the Magic Kingdom.